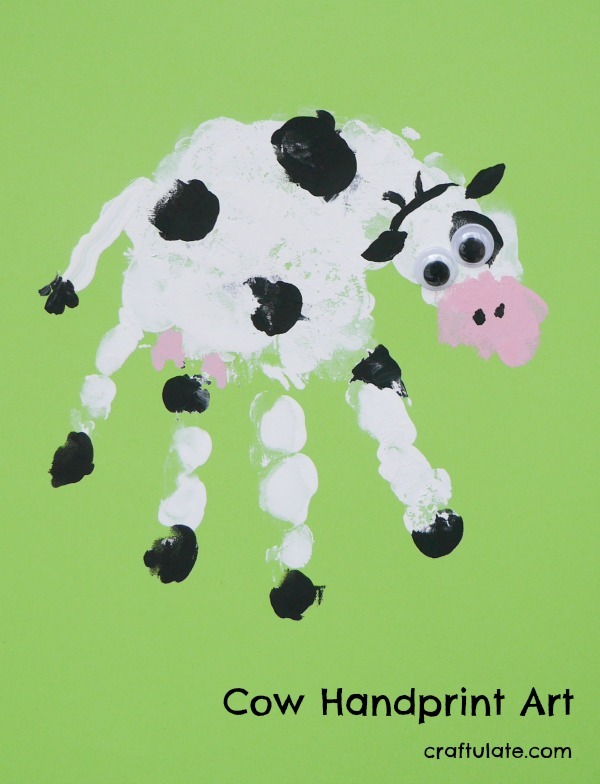 How cute is this cow handprint?!? 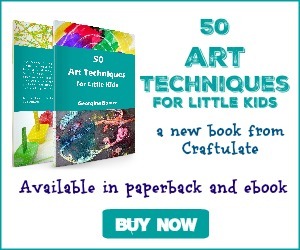 It’s a fun art project for kids to try – and I have some clean-up tips for you, too! 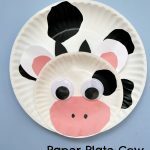 If you saw our Paper Plate Cow craft a few weeks ago, you’ll know that F is cow-obsessed right now. And therefore he’s happy – if not keen – to make cow-themed art and crafts projects. 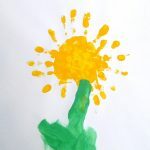 And since our last handprint project on the blog was nearly two years ago – I figured it was about time for a new one! 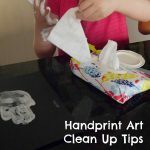 The key to successful (aka less messy) handprint and footprint art is to get everything ready in advance. So I set out the card, pots of acrylic paint (white, black, and light pink), and three paintbrushes. 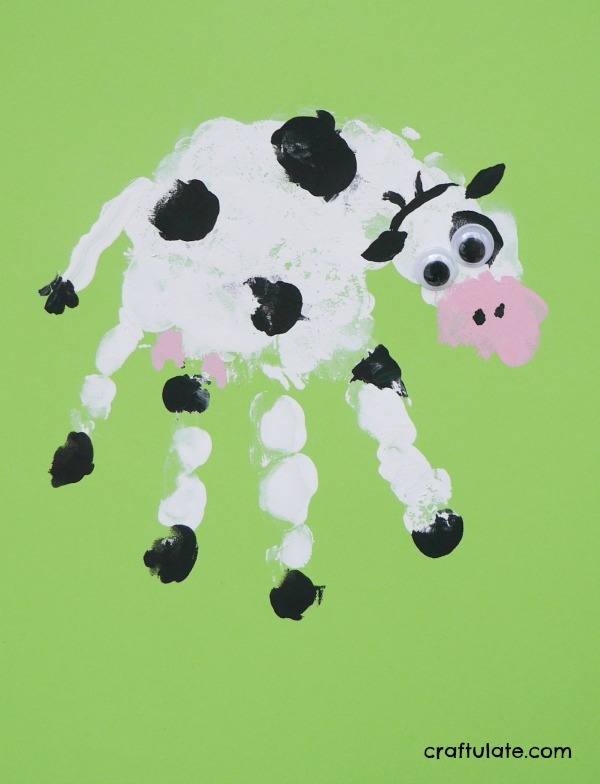 I painted F’s hand white all over, then added some black spots and black hooves. 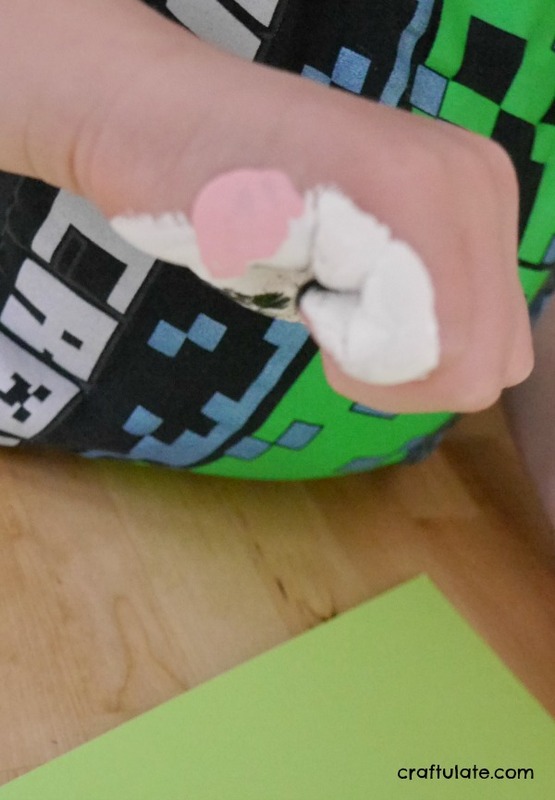 After he pressed that onto the card, I asked him to curl his hand into a fist, then I painted the little finger end of his fist with white and pink paint. This would make the head! He pressed his fist onto the card and the main part of the cow’s body and head were done! But even with all my planning – I hadn’t set out any baby wipes to remove the paint! So we headed straight to the kitchen sink (“Don’t touch anything!”). 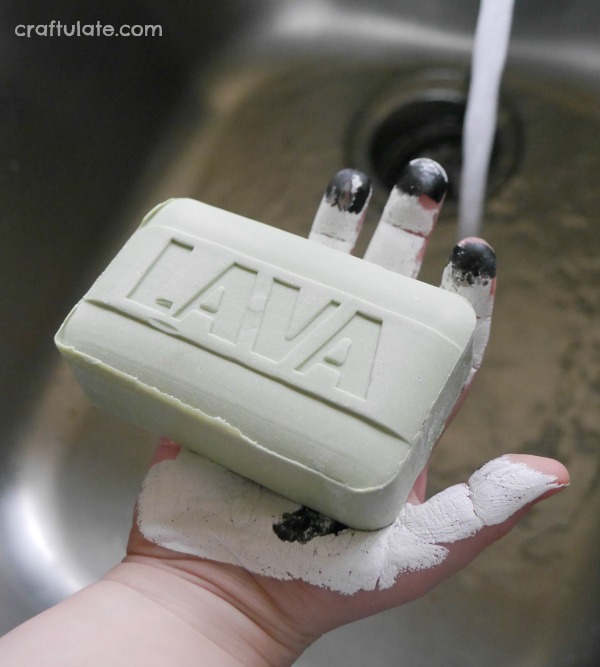 We used our trusty Lava Soap to remove the paint. It saved us before when we tried Painting on Ice! Lava Soap contains tiny pieces of rough pumice, (which comes from volcanoes – hence the name!). 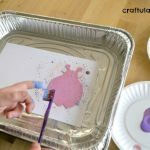 The pumice is perfect for removing paint from dirty hands – whether it’s mud, oil, or paint! After F had cleaned up, we added the extra details, like the udders, tail, ears, and nostrils. 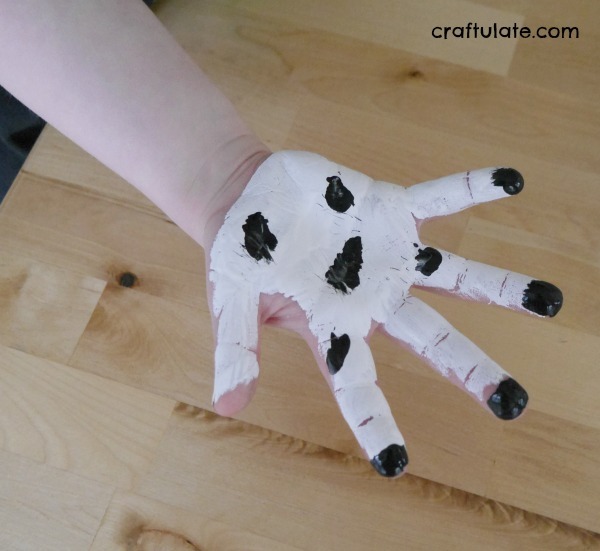 He wanted to add a patch of black for the eye too – just like in our paper plate craft! When the paint was dry, we added googly eyes and the cow handprint was complete!